Sic Bo is a game that is very popular with Asian players and though the first time you look at the game it might seem very complex this is a very simple game to learn. House edge varies hugely depending on the bets that you make and can vary from as small as 2.78% to over 10% so it is worth giving a little thought to the bets you choose. Generally speaking the house edge is greater in Sic Bo than in craps but it does depend very much on which bets you choose. Easily the safest bet at the Sic Bo table is Small/Big. Since both bets have the same odds of hitting, they offer the same relatively small house edge of 2.78%. If you are looking for other betting options that have higher variance then the next best Sic Bo bets are single number bets. Each of the single number bets also offer the same odds, so no matter which one you pick you’ll be playing against a 7.87% house edge. The only other Sic Bo bet that has a house edge of less than 10% is the triple number bet on a three-dice total of 7 or 14. The house edge for those bets is still a pretty steep 9.72%. Exploiting casino bonuses can greatly improve your odds when playing Sic Bo as can choosing player friendly game variations. A lot of casino players mistakenly believe that craps offers better odds because the players control the dice, but really the players have no more control over the result of a roll than a casino dealer does. That said, craps might be a smarter play simply because it offers a couple bets without any house edge, and its mandatory Pass/Don’t Pass bets have a house edge of only 1.41% and 1.36%, respectively. 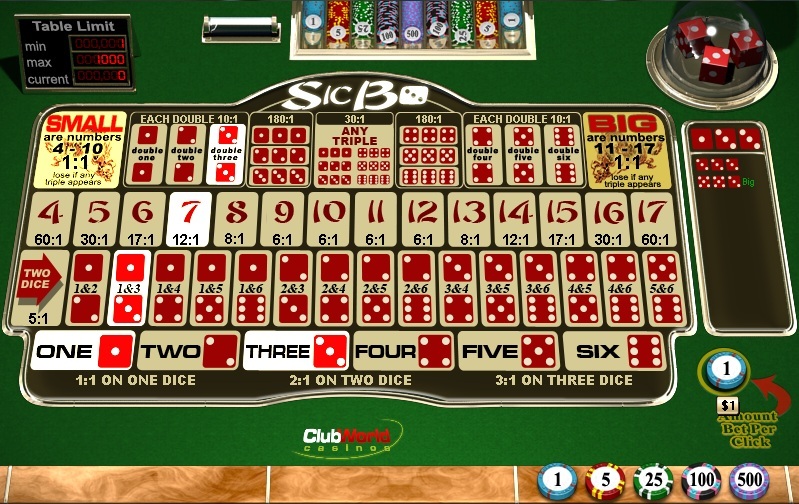 Still if you want to give Sic Bo a go and are ready to accept the game’s unfavorable odds, then some players find that playing with a betting system adds both structure and excitement to this game of chance.